The Idaho Termination Lease Letter will satisfy a requirement of the State of Idaho when one party wishes to end a month-to-month property rental agreement. The State of Idaho will require that when either party wishes to terminate such a contract that party must issue a thirty-day notice of the intention to do so. This will help the remaining party avoid the disastrous scenario of not having enough time to find a new home or cover the bills. After all, a property rental contract will drastically impact both a landlord’s and tenant’s finances and home. Both parties would need a minimum of thirty days to replace the other party when such a termination occurs. Generally, it is a wise decision to make sure that one can prove they have given ample notice when terminating a month-to-month lease. Therefore, if the month-to-month does not specifically require that such notices be posted on a property, it would be a wise idea to send it by certified mail making sure it reaches the receiving party at least thirty-one days before the proposed termination date (which shall also be the move-out date). In this way, one has not only satisfied their legal obligations but will also be able to prove they have done so if necessary. 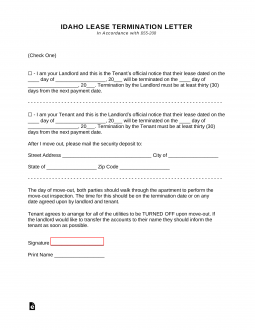 Step 2 – Enter the date of the lease being terminated. Step 4 – Sign and print your name. Step 1 – Check the second box. Step 2 – Enter the day, month, and year of the lease being terminated. Step 3 – Enter the day, month, and year the lease shall be considered terminated. Step 4 – In the next paragraph, enter the street address, city, state, and zip code where you may receive your security deposit. Step 5 – Sign and print your name.